Nouveau Paris Monumental Itieraire Pratique de l'Etranger dans Paris. Plan de Paris Divise en 20 Arrondissements. This is an iconic 1946 tourist pocket map of Paris, France. Maps are printed on both sides of sheet. On recto, this map centers on the Seine River, and covers the embastilled heart of Paris. Designed with the tourist in mind, this map shows all major monuments and historic attractions, including the Eiffel Tower, in profile. Paris itself is set as if in a verdant garden surrounded by the Bois de Boulogne and various suburban villages. The map on verso details the Metro system, showing streets, stations and buildings. This map was issued in various editions from, roughly 1900 to 1937. Here it is issued as part of a tourist guidebook published in 1946. The guidebook consists of a street index, along with other important tourist information. Printed by Gaston Maillet & Co., this map was published by A. Leconte, of 38 Rue St. Croix de la Bretonnerie, Paris. A. Leconte (fl. 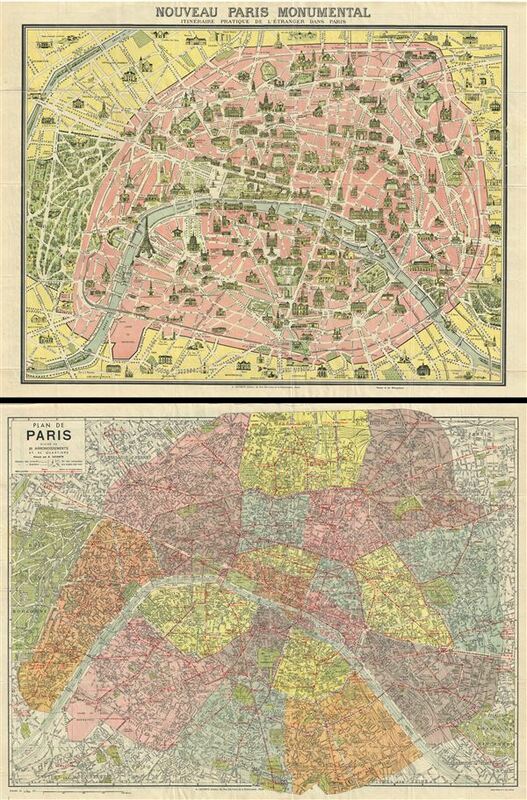 1880 - 1930) was a Paris based guidebook and map publisher active in the later part of the 19th and early 20th centuries. He is one of the publishers of the attractive art nouveau style "Nouveau Paris Monumental" series. Leconte is often associated with L. Guilmin, another Paris based map publisher of the same period. Leconte s name appears on maps and guidebooks of Paris well after his death ( though we can't date this event with any precision ) to about 1980. Very good. Some wear along original fold lines. Map of Paris showing railway lines on verso. Accompanied by 175 page pocket guidebook.